Good writing.  I just sold my IS3 to buy IS4. I think that it is better to uprade the gun before the turret(I got the turret b4 the BL9). With the best engine researched at IS, player should be able to do this. I didnt get the gun 1st because I was so frustrating with the stock IS3 and wanted to make some change in the tank. But it proved that just changing the turret was not very effective. Its a very expensive tank for a non premium player? I know the 122 mm gun is expensive but how about repairs after a bad match? 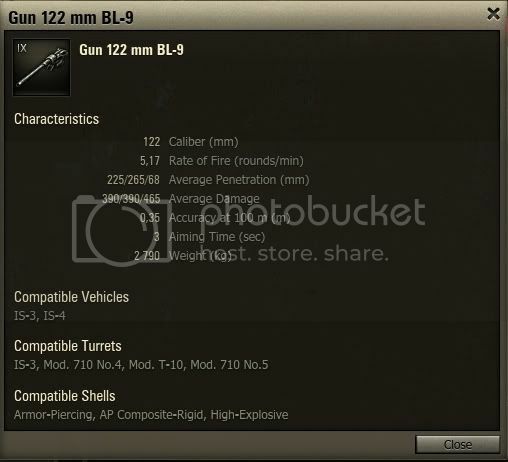 All the 122mms in the IS series (including the BL-9) use the same ammo. With premium I think I've maybe had one or two matches where the IS-3 didn't make SOME profit. The trick is only firing when you know there's a reasonable chance of a hit or damage, since the AP shells cost 1025 apiece and HE 608. 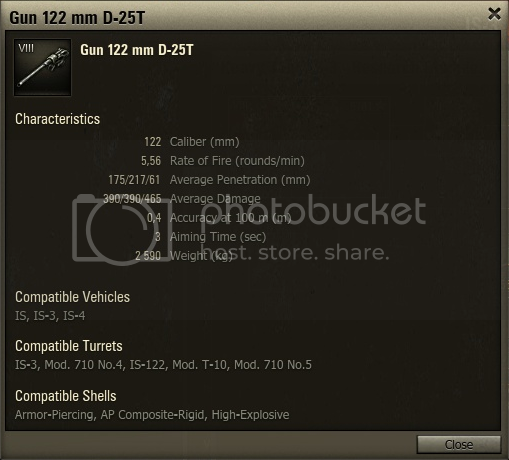 So if you wanted to maximize the IS-3's profit, try using HE more often off-premium for non-critical shots. fortunately the bl9 is much more accurate than the d-25t it replaces. you wouldnt think .05 better makes a difference, but it really does. Even often taking shots that are kind of risky, I still maintain close to 80% accuracy with it. 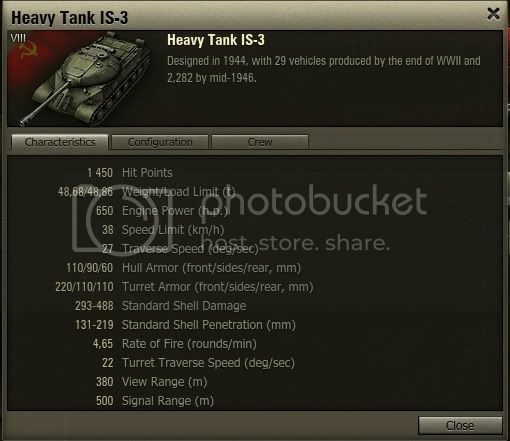 The full repair cost of IS-3 is over 13k. So if you play without premium, don't count on making any profit if you are killed or take a lot of damage (even in case of victory). The gun is quite slow, so you will fire more than 10 rounds in a battle only rarely. With 10 good hits you can make around 30k(if the team wins) for the cost of 10k, but the chances are not that high -- lots of non-pen hits even against other tier 8 tanks. In short, you will have a profitable game only if you survive. Having said that, my survival rate in IS-3 is significantly higher than in IS, so overall I'm on the plus side, but very marginally. The reason for that is that starting at tier 8, you'll be the top tank very often, which makes it much easier to survive the battle (and consequently profit). 1v1 they are as a whole well balanced." --Talking about KT here? In my humble opinion the KT would beat the IS3 any day. I agree. Played by a good driver, a KT will own an IS-3. On the other hand, when a KT driver decides to go face to face with an IS-3, the IS-3 will most likely whoop the KT. I've been in one "dogfight" where a KT kept shooting my IS-3 head on and bounced plenty of shots. The few that connected hurt and left me with low health, but in the end, my multiple shots to his lower glacis ended his fight. Unless you use torsion bars, you must upgrade either the suspension or turret to provide enough capacity to equip the BL-9 (it's only slightly heavier than the previous guns but it's still enough to keep you from equipping it immediately). Upgrading the turret makes much more sense than the suspension due to all the other benefits it gives you. 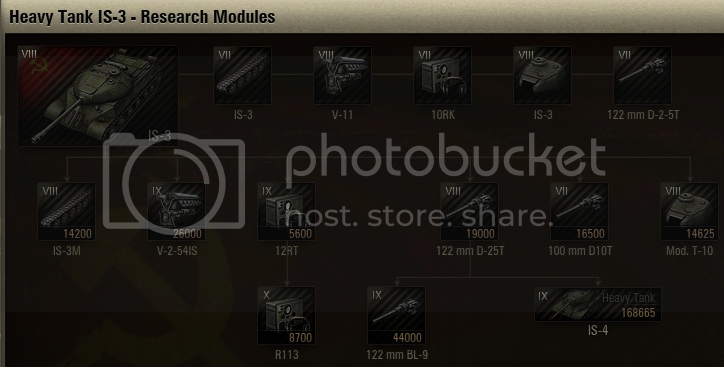 I have never once been ammo racked in the IS-3, somehow. But, yes, the BL-9 makes this a baby IS-4. I now laugh at Lowes. But, yes, the BL-9 makes this a baby IS-4. It really doesn't. You would think it does but when you get the IS-4 it becomes EVEN BETTER. The S-70 is plain amazing. - My IS-3 was ammoracked by Object704. Was oneshoted in frontal armour. IS-4 also have 2 ammo rack - 1 in back of the turret, second in left part of tank, just behind lower frontal armour plate. "With this machine using the 122mm BL-9 you will finally be a threat to everything, even IS-7s and Maus tanks"
If by threat you mean minor annoyance, I suppose. I'm sorry, 110 hull armor, whose slope is compromised so easily in urban warfare tends to result in this tank being frontally killed in 4 shots by equal or higher tier tanks. The other 2 tier 8 heavies have certain virtues in tough situations, but the IS-3 is essentially an overarmed super-sized medium tank. And despite the side armor being "better", it will still fail under fire from any equivalent tier tank, if they need to bother aiming there at all.